The holidays are around the corner, and we’re warming up to the season of baking (and giving) baked goods with these banana bread muffins. 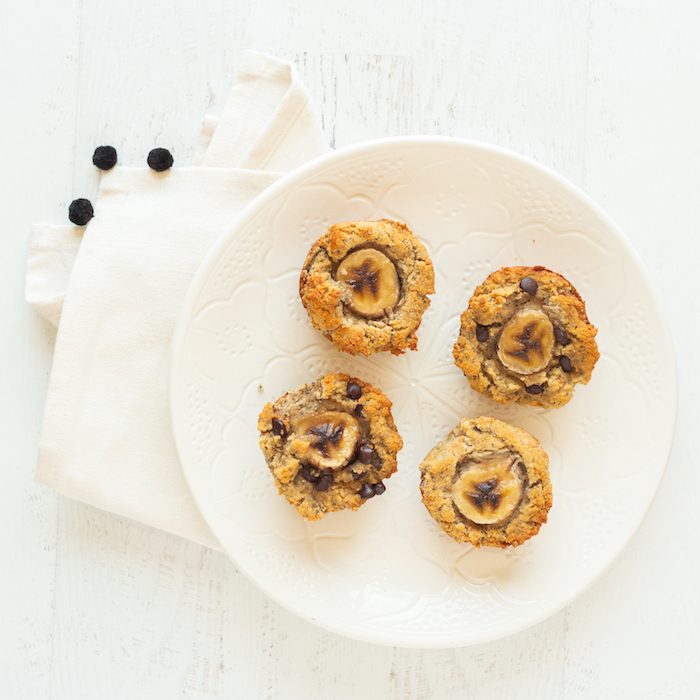 Our friend Kelly LeVeque made these healthy, refined sugar-free goodies that are nutritionist- and tastebud-approved. In a large bowl, mix all of the wet ingredients: oil, maple syrup (or monk fruit sugar), bananas, vanilla, and almond milk. *Do not melt coconut oil or use warm coconut oil because this will cook the eggs. In a medium bowl, mix dry ingredients: flour, baking soda, salt, and cinnamon. Slowly fold the dry ingredients into a wet batter. Lumps are okay. 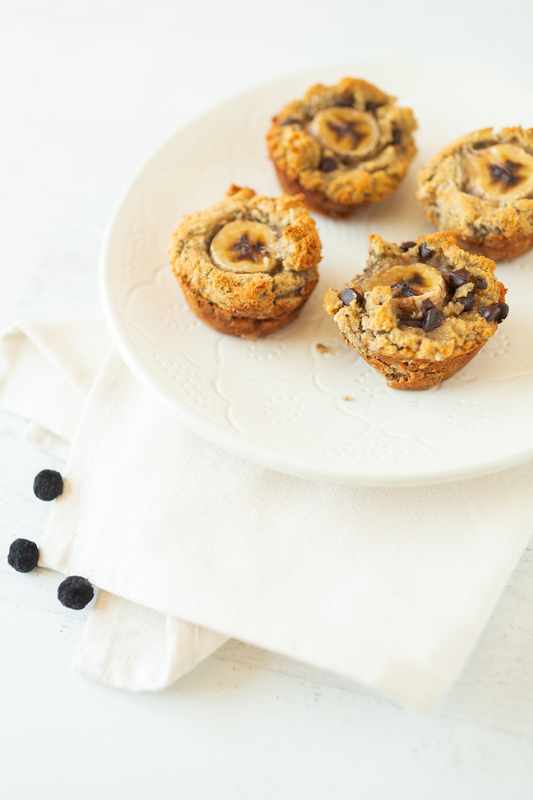 Mix in chocolate chips and pour batter into a coconut oil-greased muffin tin. 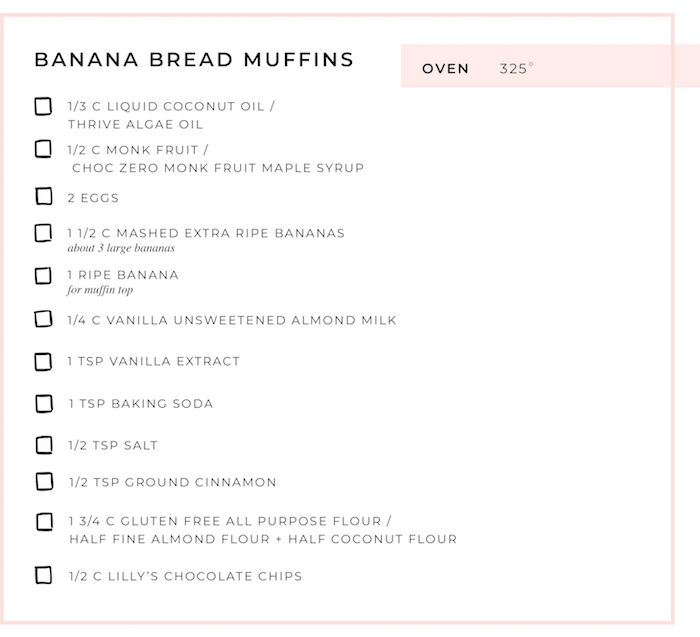 Top each muffin with a 1/2 – 1 inch thick slice of banana. Bake muffins for 25 minutes or until a toothpick comes out of the bread clean. What other things are on your list to bake this fall? See more of our favorite recipes from Kelly here. I just had a question about this recipe. It says you can use 1/2 c of Monk Fruit – is this real monk fruit or a sugar made from monk fruit? In the written part of the recipe “in brackets” it says Monk Fruit sugar? Thank you so much for asking, Nadine! It would be 1/2 cup of monk fruit as a sweetener. 💗Here is one from Thrive Market as an example!